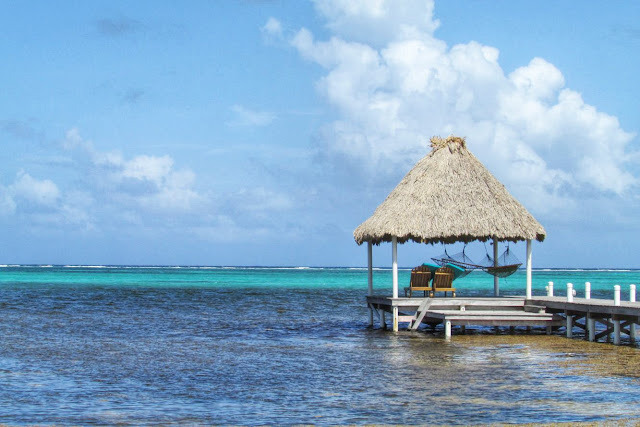 Belize was recommended to me by a few well-traveled friends of mine, and since it's only a 5 hour flight from California, my boyfriend and I decided to vacation there last month. We were looking for a tiki beach hut style hotel, and we both agreed that the Portofino Beach Resort in Ambergris Caye looked like the best option. What I didn't realize before booking our vacation is that once you arrive in Belize City, you have to take 2 hour boat ride to Ambergris Caye. You can also take a small plane that's only 20 minutes, but it's $150 as opposed to the $15 water taxi. We arrived at our resort and were immediately greeted by the staff with 2 rum punch drinks. The resort was gorgeous. We had our own tiki hut cabana on the water with a hammock on our porch, and our canopy bed was lined with heart shaped rose petals. The pool was right on the ocean, and they had hammocks scattered across the resort, as well as in the ocean. They also have an outdoor bar with great drinks (the papaya banana smoothie was my favorite!) and the food was excellent. A lot of tourists actually take a boat over to our resort just to eat there. The resort provides you with kayaks, snorkeling equipment, and bicycles, all free of charge. The downfall of the ocean water in Belize is that they have a major seaweed problem, so the shore is lined with seaweed, and there are workers everyday who shovel it all day long. So you have to kayak out to the middle of the water where it's crystal blue and there are coral reefs. Beware, there are sharks! We saw sharks, sea turtles, and a sting ray. They're all harmless, but it is a bit freaky if it's your first time. One of the downfalls of our resort was that the location is 6 miles from the main area of San Pedro, where the bars and shops are. We biked there one day, but biking 6 miles in the heat and humidity is no fun! I opted to rent a golf cart in San Pedro ad throw my bike in the back and drive back. Another downfall is that we visited during the month of July, which is their off-season. Their peak months are around November and December. We walked to some of the nearby resort restaurants and bars but everywhere was pretty quiet. Aside from snorkeling and scuba diving, there aren't a whole lot of activities, but it's a nice place if you're looking for a relaxing getaway.